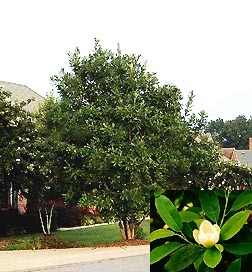 We planted the Sweetbay, with its 2 to 3 inch creamy white blossoms close to our mailbox and in full sun. From late spring to late summer, it became a daily joy to walk the drive and retrieve our mail. You would want to linger for a time to capture the lemon scented Victorian fragrance and to wave to a neighbor passing by. After 10 years of growth it stands as a specimen in the neighborhood.